Froggymead (Fernworthy Stone Circle) - office23s jimdo page! Through narrow country roads and lanes we travelled until we came to the official car park by the reservoir and halted. We planned to make an expedition of our day here, a walk around the reservoir then up to Froggymead and then onto Greywethers (stone circles). There were only one or two other cars parked in the carpark and their occupants nowhere to be seen. The stone cist within the cairn circle adjacent to Fernworthy Reservoir. We set off along the southern bank of Fernworthy Reservoir, the path passes closely to some fantastic hut circles before crossing a bridge below the splendid water strewn walls of the reservoir dam. Both these places are worthwhile exploring for a few minutes. As the path, rather mudily, passes by the eastern shore of the reservoir further exploring will reveal a terrific cairn circle and cist. 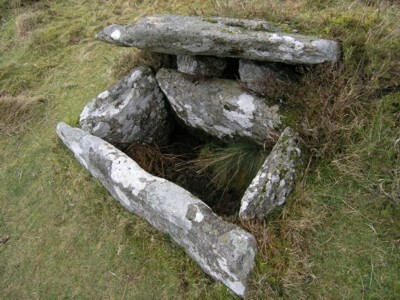 The circle is heavily overgrown but the cist is more or less complete, the stone lid jauntily askew. As we walked between the low boulders of the southern stone row into Fernworthy Stone Circle the rains began to fall, we sheltered under trees an put on our waterproofs. 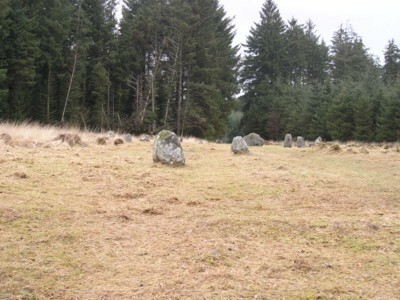 The circle is of a reasonable size with stone rows of small and sometimes very small rocks to the north and south. It stands in a clearing between plantation trees which obscure any views of the surrounding landscape. 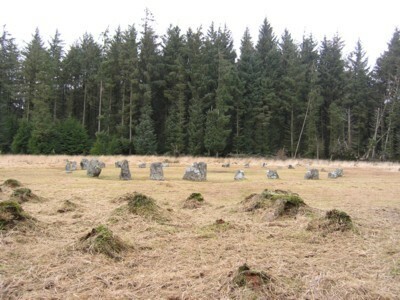 The stones that form the circle tend to be short and squat, pehaps more ovate than phalic in nature; others have comented upon how they tend to decrease in stature towards the north. We took a brief diversion to view a nearby cairn before walking the the northern section of the stone row. Our perambulations over we headed along the path to Greywethers when I decided on a change of plan - Greywethers would be no fun in this grey weather. The rain was cold, constant and heavy, flowing in small rivulets along the wide slick forestry tracks, even on the brightest of days I find walking in plantations extreemly claustraphobic, opressive and depressing. My altered plan was to have a quick look at some hut circles, perhaps make it as far as Hemstone Rocks and then hightail it back to the car. We spent some time looking and walking around a collection of overgrown hut circles and we may have even marched as far as Hemstone Rocks, but, with our heads down agains the bite of the cold rain we became disorientated and possibly walked right past them. With some ready-reckoning and a compass I found our way back across the Sandeman Bridge and to the awaiting shelter of the car. Greywethers will have to wait for another day, perhaps an early dawn when the stones are said to turn and warm their faces in the rays of the morning sun.